.LOCATION! LOCATION! LOCATION! The perfect receipe for a wonderful vacation. 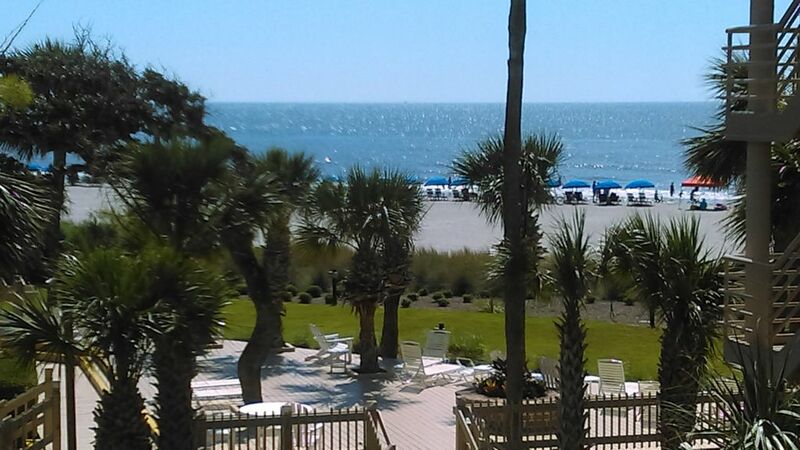 Villamare offers a superb location in the heart of Palmetto Dunes on the most beautiful beach area in Hilton Head. You will also find unmatched amenities at Villamare as it is the ONLY complex in Palmetto Dunes with an indoor facility offering a heated indoor pool, sauna, jacuzzi, and workout area with attached flat screens. There is also a large outdoor oceanfront pool with a jacuzzi and beautiful oceanfront grilling area to kick back and enjoy the views while you prepare dinner. 1) It is located on the second floor with a nice ocean view but not too high to take away the convenience - the pool, beach, and grilling area are right around the corner by stairs or elevater! 2) One of the closest units to the ocean - you can actually hear the surf! 3) One of the few units that has been totally updated. Villamare is within walking distance to world renown Palmetto Dunes Tennis Center, three of the island's top golf courses - Robert Trent Jones, Arthur Hills, and Fazio, two of the top restaurants- Alexander's and Conroy's , rentals for navigating in the 11 mile lagoon system, or bike rentals. Keep in mind that there is a FREE shuttle ( Palmetto Dunes Shuttle) that is only a phone call away that will take you throughout Palmetto Dunes. This includes the Shelter Cove Marina, Mall, grocery store, shops, restaurants, and boat rentals. The arrival time for the shuttle is extremely quick after you call. JUST GO AND ENJOY! Master bedroom has a king bed, garden tub and shower ,42 in. lcd, and balcony with same view as shown. Second bedroom is the same size with a king bed, new queen sleeper sofa, 50 in. t.v., private bath, and a balcony with a view. Living area has a 55 in. t.v. and balcony with a wonderful view! Beautiful and well kept condo at a great location, right on the beach and bike trail! We loved staying here. Everything was in good condition and the location, view and amenities can't be beat. Lovely. Very nice apartment with recent updates. Perfect location. Kind and helpful owner. Wonderful unit with great views in a spectacular location! The unit is lovely with tons of space and privacy. The bedrooms are on opposite ends of the condo, so it is nicely laid out and there are balconies with ocean views from both bedrooms and a gorgeous view from the common space. Beautiful ocean views and a fabulous location close to the pool and grilling area and just steps from the beach. This was our first time staying in Palmetto Dunes and we really enjoyed it! The condo is conveniently located to restaurants, the general store, bike rentals, and lots more! We have a seven-year-old and an almost 2-year-old and it was a perfect spot for a family! We’ll definitely be back! Family of 5 had a great time. Condo was as described and met all our needs. Plenty of things to do within walking distance and beach was awesome. We will be back next year!! Overall the condo was clean & nicely decorated. We could tell that some recent updates had been made. We did not cook, but it looked like the kitchen gadgets, small appliances & cookware was in need of updating. No hair dryer so I had to buy one. Be aware that the shower in the second bedroom is small, but it's fine for kids. We would definitely stay here again. Thank you for your review. However, I think if you would have cooked you would have found that the cookware was actually very nice and new ceramic cookware along with very high quality stainless steel pots, etc. The shower in the guest bedroom is smaller than the other bedroom. However, it has been updated from the original one that is in most of the Villamare units in this building and is larger!! It is indeed an adult shower and certainly not made for kids - that was a very misleading statement. I appreciated your phone call during your stay telling me that the place was lovely and you loved everything about it. Thank you for choosing my property and hope to have you back as a future guest. Lovely time! Having never been to Hilton Head before, the owner was very helpful with details and answering all of my questions prior to arrival. The condo was clean and spacious for our family. Palemetto Dunes was wonderful with lots of activities. The rental was close to the beach so that we could make the most of our vacation. Would definitely recommend to others and would stay again if we are fortunate to visit the area again! MONTHLY RENTALS ARE AVAILABLE November -Febuary.